Croc Blog: You don't want your unique, endemic species anymore? You don't want your unique, endemic species anymore? This kind of story is tragic and sad, but typical of the problems faced with conservation of crocodiles. 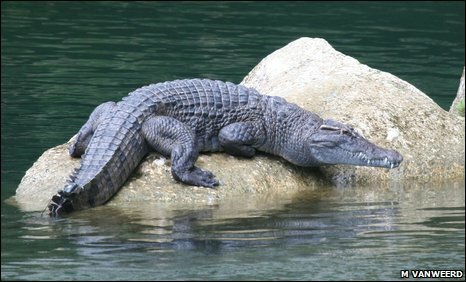 The Philippine crocodile (Crocodylus mindorensis) is considered perhaps the most endangered of all the species, with less than 100 individuals remaining in the wild and considerable pressure on its remaining habitat. Yet there are now estimated to be 7,000 Philippine crocodiles in captivity, more than enough to help replenish wild populations before they disappear forever. The problem is getting permission to release them. It seems nobody in a position to grant this permission wants any Philippine crocodiles released back into the wild, based on unfounded fears that these crocodiles may start to kill people (there has not been a single documented attack by a Philippine crocodile on a human recorded). There has always been confusion in the Philippines between the Philippine crocodile and the saltwater crocodile (Crocodylus porosus) and the admittedly rare attacks by the latter species have unfortunately also tarred the reputation of the former. Yet it should be clear to anyone in the Philippines of the value of crocodiles to their country, on a week after the world's largest saltwater crocodile was captured and placed into captivity for the purposes of tourism and education about crocodiles. Perhaps those same officials who refuse to consider releasing an endemic and unique crocodile, a species that should be a source of national pride for their country (and international derision should it be allowed to disappear forever), should read their own newspapers and realise how important (and valuable) crocodiles can be for a country that is lucky enough to still have them. To reply to your question. Yes, I really do want our endemic species back in the wild. Unfortunately no one else in my country really cares about stuff like this anymore. If the government would give funds to our local herpetologists, I would gladly volunteer to help.